This is a recipe for when you're having a lazy hair day but want to get best out of your protein hair mask. So, the first step is getting the aloe vera gel out of the stem. I do this with a knife and use a blender to make the gel less gloopy. 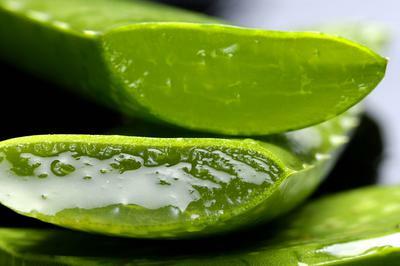 I pour in my castor oil and tea tree oil into the aloe vera gel and mix thoroughly. You can apply this into your hair with your hands, dividing your hair into sections and ensuring that it gets to your hair strands, roots and tips. The tea tree oil heals your scalp and stimulates hair growth, the aloe vera also has nutrients and healing properties and the castor oil supplies your hair with its protein needs and strengthens your hair strands. have a lovely hair day! Thank you so much for sharing this idea! For years now I have been putting aloe vera gel in my hair but have not yet tried adding in tea tree oil and castor oil. Join in and write your own page! It's easy to do. How? Simply click here to return to Healthy Recipes.